Even though it’s the holidays and we’re going to be celebrating with our families, our cattle come first. 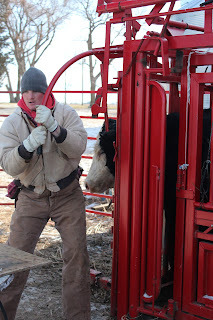 This morning (like every morning) Kevin headed out to hay the cows and feed grain to the calves and bulls. When we say farming is 24/7/365 we mean it! Even if it’s the holidays and/or vacation time, the cattle still need to be fed and taken care of. Yesterday we had the vets come out and “Preg Check” all of our cows. 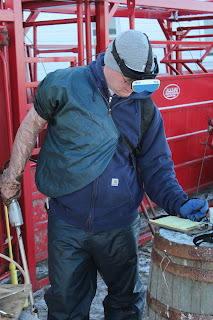 What that means is they use an ultrasound machine to see if each of the cows is pregnant and how far along they are. We artificially inseminated (AI) them back on June 3rd, so the earliest any of the cows should be having calves is March 12th. About a week later we put a bull out with them in case some of the didn’t take to the AI. The reason that we “Preg Check” cows is so that we know how far along each one is and when we can expect the little calf to arrive. It is basically just like when a woman gets an ultrasound done when she is pregnant. The doctor measures the baby to see how many weeks along the mom is. The vet does the same thing with these cows and their “babies”. So the first thing Kevin had to do yesterday morning, is bring all the cows in from the field across the road. He rounds them up on a four-wheeler and walks them across the road and into the pasture to the south of our house. From there he gets them in the corral by the barn. Below is a picture of our cows heading down the corral to the chute where they will be “Preg Checked” and vaccinated. There were three guys (the vet and two assistants) that came to work the cows. One guy helped Kevin move them into the holding pen on the far end of the chute. The other assistant ran the head gate and gave the vaccinations. And the vet used the ultrasound machine to see how far along the calves are. I took pictures and assisted where I was needed. The vet inserted a wand that sent out ultrasound waves in the cow. He could then look into the eye piece that he was wearing and see the calf and measure how big it was to determine how far along the cow is. He would then jot down any notes about that cow (i.e. her ear tag, how many months she was, etc.). There were two vaccinations that they gave to the cows. One was to help keep the cow from aborting the calf. This doesn’t happen very often, but if we have a really cold winter a cow may abort the calf. So this is a preventative measure that we take. The other vaccination that the cow receives is actually for the calf. It helps them not have scours (diarrhea) after they are born. They also sprayed some POUR-ON on the cattle. This is a parasiticide that kills any roundworms, lungworms, grubs, sucking lice, biting lice, mange mites and horn flies that the cow may have picked up and prevents them from getting any of them also. This cow is next in the chute to get “Preg Checked”. Some times the calf is so far along that the vet can’t see past the cervix so we has to reach in to feel for the calf. As soon as each cow was done, we ran them back behind the barn where they got to eat some hay while the rest of the cows were “Preg Checked” and then we ran them back across the road to the corn fields.